If you like books on education to be filled with practical links to the classroom that will help your instruction and make you a better teacher, this is not the book for you. While there are some practical aspects in the content, it is not a book that will tell you what to do. People might call it philosophical However, this is misleading in a way. Some may say that their is a divide between philosophy and practice, but as I see it, they are one and the same. You cannot have philosophy without practice, and you cannot have practice without philosophy. I think this in one of the strongest messages of the book, how historically the philosophies of thought (Western thought, as that is the central subject of the book) have developed alongside the conceptions of teaching, learning, and knowing. There is a flow, and Davis does a wonderful job of capturing it, between philosophy and practice. Tracing thought from ancient Greece into current day complexity and network theory it spans the history of human thought (thought not is a great deal of depth, as it sits at only 200 pages). The book is very fractal in nature, and can be read in a linear progression from the first page to the end, or it can be experienced in different directions. At the end of each section, Davis gives recommendations on where to go next, depending on the shape you want your lived experience of the book to take place. It starts with central questions about the nature of the universe, and how humans have tried to understand the world through differing viewpoints about how we experience the world. Davis then begins to examine the metaphors, language, history, and practice of education (among others ideas) associated with each. It branches off into two directions; the physical and the metaphysical. Each branch of the tree, ends with a conception (or as the title suggests, an invention?) of what teaching and education is/was. Before it gets to the end, it goes through several phases. The first is the knowing part, or what the source of the knowledge is. Next, is the learning part, or how we come to know. Finally, we end with the teaching section, and in this area of the circle is where education lives. 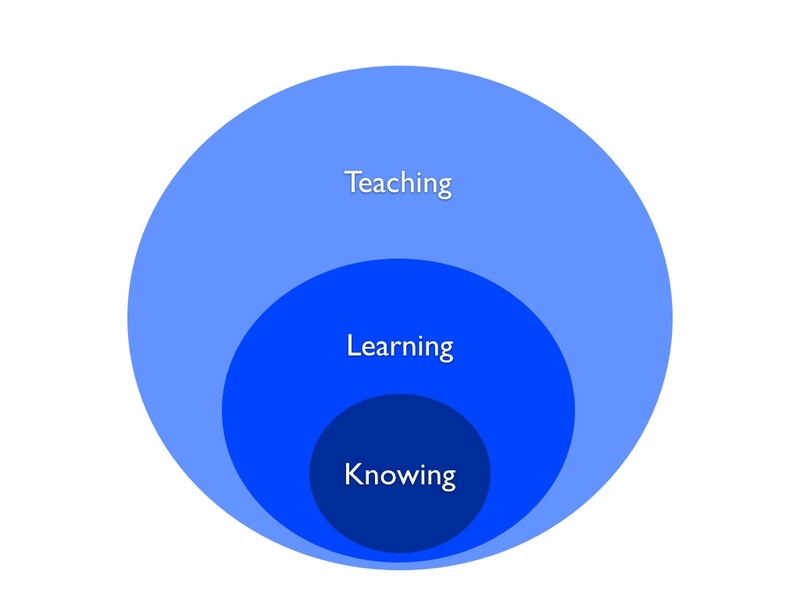 The interplay and nested nature of knowing, learning, and teaching is fascinating. What does it mean to say that teaching is facilitating? What is the historical and philosophical base of that metaphor? For me, the journey up these three spheres was the most illuminating part of the book. It was fascinating to see how ideas in education can be traced back to these (sometimes) old philosophical questions of the nature of the universe. To me the message was this; your personal philosophy matters, and what you think of knowledge, affects what you think of learning, which affects what you think about teaching. It goes the other way as well, as ones conceptions of teaching will affect how they view learning which will suggest that how they view knowing. 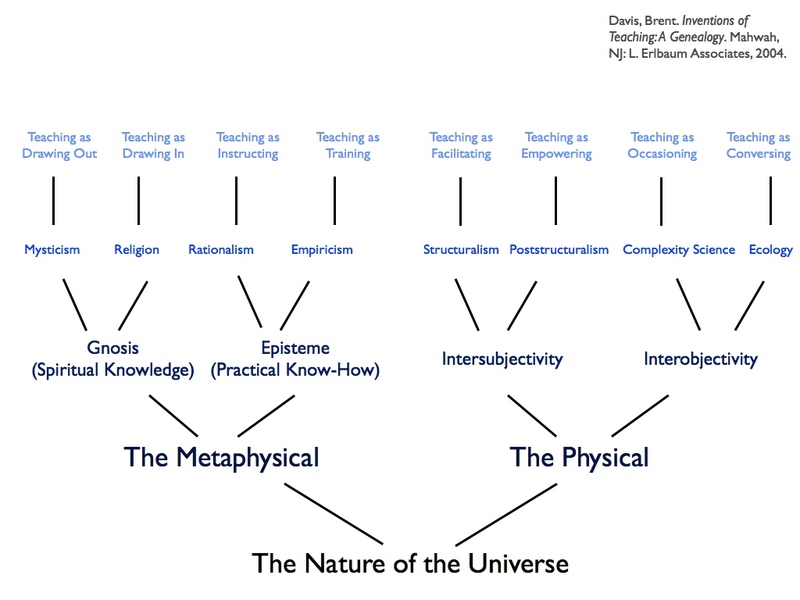 Although from the overview below, it appears that each branch is a distinct from the other pieces, Davis takes care to to point out to the reader that these are not separated with a slash (Gnosis/Episteme), which separates the two and puts them into a dichotomous type relationship, but rather they are separated with a V (Gnosis V Episteme) which suggests that a bifurcation has happened. The difference may appear to be small, but it is important to remember that as philosophies of knowing, learning and teaching evolved and changed, many of the basic assumptions from the bottom of the tree remain at the top. Here is a brief overview of the fractal tree of the book. If this is something that you enjoy, I encourage you to check it out. If you are into the history of education and the philosophy of thought, this is an absolutely fascinating read. It gives a different perspective on why education is viewed the way it is, and why we do some of the things that we do (or why we maybe we shouldn't do them). At the least, it will get you thinking about this; What is your conception of teaching? And what are the explicit and implicit metaphors and affordances associated with it?